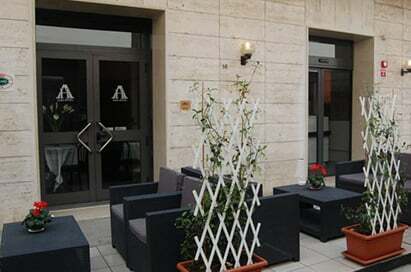 In Florence we can arrange a number of visits that will enrich your students’ experience. As well as a course of language lessons we are able to arrange visits to a number of museums and galleries, as well day trips to the beautiful cities of Siena, Pisa, Assisi, Venice and Volterra, amongst others. Free time for shopping and sightseeing. The Accademia di Belle Arti was Europe's first school of drawing. 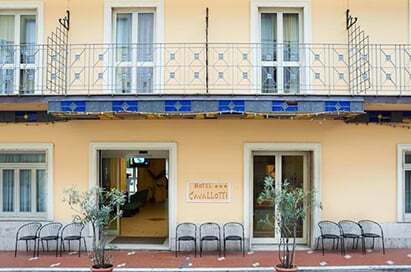 The Academy Gallery houses works of Italian sculptors like Michelangelo (main gallery), including the original David. The most famous bridge in Florence and also the oldest, this structure with three stone arches replaced a wooden bridge which had crossed the Arno River at this spot since Roman times. 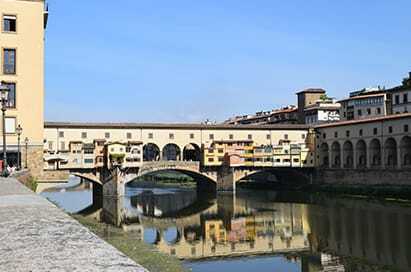 The upper side of the bridge, known as the Vasariano corridor, was designed by Vasari to link the Palazzo Vecchio and the Uffizi Gallery to the Pitti Palace; today it is an art gallery. The bridge is inhabited. Originally the sides held food shops but by the end of the 15th century the shops were assigned to goldsmiths and silversmiths. An opening midway across the bridge offers views of the river and shore. Dominican monastery that serves as a distinguished monument to the religious and artistic history of Florence, which features valuable examples of Florentine paintings from the 14th and 15th centuries. 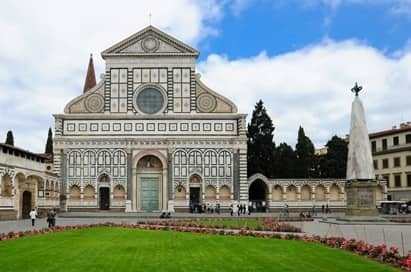 Situated on Piazza Santa Maria Novella, with its original five-sided shape, is one of the largest squares in the old city centre of Florence. The civic heart of Florence. 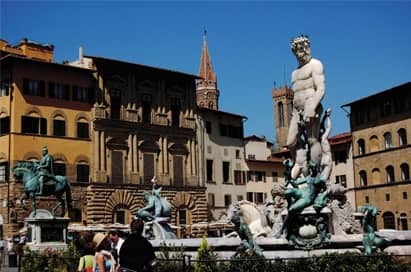 Home to the Palazzo Vecchio, and the location of the original David by Michelangelo, a copy can now be found here. Statues, fountains, cafés and gelaterias can now be found in on the Piazza. During the 14th Century – Florence's golden age – crowds collected here. It is where Savonarola preached hell-fire against the decadence of the city and held his Bonfire of the Vanities, only to be burned at the stake in the same spot exactly one year later. The walls are lined with tombs, and 276 tombstones pave the floor. 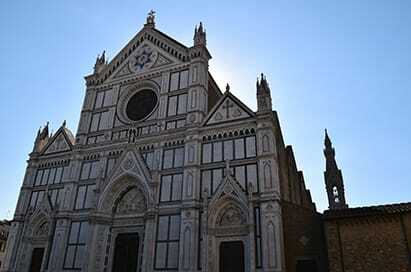 The church's most famous inhabitants are Michelangelo, Macchiavelli, Galileo and Bardi. Its various chapels feature works of art by Giotto and della Robbia, and the serene cloisters were designed by Brunelleschi. The gallery's wonderful collection is arranged to illustrate the evolving story of Florentine art. Some of the most famous pieces are in rooms 7-18; they include Botticelli's Birth of Venus, Titian's Venus of Urbino, Michelangelo's Holy Family and Piero della Francesca's Duke & Duchess of Urbino. The guided tour was very good. The lady was very friendly and flexible. She did not talk too much and she tried to entertain the students.